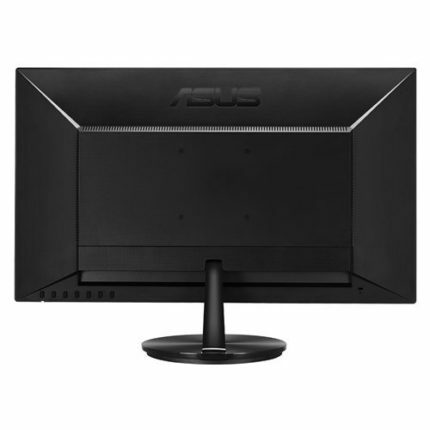 The ASUS VN279QL is an affordable monitor which is ideal for high-quality gaming, movie watching, and everyday use. 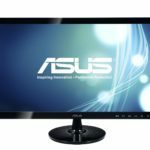 Although it may cost a little extra than the more common Full HD resolution monitors, it provides you with a remarkably thin bezel design, various unique features, highly responsive performance, and a vibrant image quality. Due to the nature of its performance and image quality, it’s mostly suited as a gaming monitor. The old VA panel monitors were known as an inferior type to the IPS because of the slower response time, less wide viewing angles, and the lesser color accuracy. Nowadays, with the AMVA+ (Advanced Multi-Domain Vertical Alignment) panels, monitors such as the ASUS VN279QL offer the same 178-degree viewing angles and the top-notch 5ms response time as the modern IPS monitors. However, the color accuracy is still behind the IPS technology and therefore professional designers and alike still prefer them to VA panels. On the other hand, VA panels provide a superior contrast for a better relationship between the darkest and the brightest tones as well as for more deeper blacks and stellar white colors. Although the static contrast is not officially specified for the ASUS VN279QL, it should amount to at least 1,200:1. In combination with the maximum brightness level of 300 nits, the monitor delivers an outstanding image quality with expressive and clear details. The dynamic contrast of 100,000,000:1 is incorporated into the ASUS Smart Contrast Ratio feature which can be manually enabled/disabled or automatically applied to the screen by using the picture presets. The pre-calibrated presets of the Splendid Video Intelligence Technology use optimal parameters of the dynamic contrast, brightness, sharpness, and color settings in order to provide the best viewing experience in accordance with the different activities you watch on the screen. These picture presets include Scenery, Theatre, Game, Night View, sRGB, and Standard. Although the ASUS VN279QL features a true 8-bit panel, the colors aren’t as precise and consistent as they are on the IPS panel monitors. With proper calibration, the monitor can be used for some minor professional tweaking, but any more serious and demanding designing will require an IPS panel monitor with sRGB or Adobe RGB color gamut depending on the type of professional work. It’s the area of gaming where the ASUS VN279QL really shines. With the quick 5ms response time and the exceptionally low input lag, the gameplay will run as smooth as butter without any ghosting of the fast moving objects. Additionally, the 1080p resolution at a 27-inch screen provides larger pixels due to the lower pixel density which some users prefer when playing competitive FPS games as it increases their precision. The OSD buttons are placed at the rear, underneath the screen. Although their place may not sound convenient, it’s easy to navigate with them as they’re very responsive and the OSD menu is quite user-friendly. The buttons can be used as shortcuts for various functions including swapping between the picture presets, auto-adjusting (only with VGA), adjusting brightness/contrast, toggling between input sources, and activating the QuickFit feature. The QuickFit Virtual Scale feature allows you to place several different layouts of grid over the screen in order to easily format your letters, photos, documents, etc. Once in the OSD menu, you’ll have access to several more features including the color temperature setting which consists of four presets including a mode in which you can manually configure red, green, and blue color levels. Besides the usual adjustable parameters such as contrast, brightness, saturation, aspect ratio, and input source selection, there are two more exclusive features. The VividPixel technology increases the sharpness of the image, however, if increased too much the image becomes distorted. Therefore, it is best left disabled or at 0.25 maximum for a slightly sharpened image that still looks engaging. Lastly, the GamePlus feature allows you to place a crosshair overlay on your screen for increased precision in FPS games. The ASUS VN279QL won two awards for its design, in 2012 and in 2013. It features an exceptionally narrow frame at 8 millimeters which makes it ideal for the multi-display setups. Additionally, it offers many ergonomic functions such as the ability to tilt by -5, 22 degrees, swivel to the left and right by 160 degrees, rotate by 90 degrees, adjustable height from 0 to 110mm, and lastly, it is VESA mount compatible with 100 x 100mm pattern. The rear bezel has a textured scratch-proof finish while the screen is covered with a matte finish. The ASUS VN279QL features a VGA, DisplayPort, and an HDMI port. The HDMI port also supports the MHL which allows you to connect your compatible mobile device and stream high-quality content whilst simultaneously charging the device. There are also two audio ports, one of which is for the 2W built-in speakers while the other one can be used for the headphones. 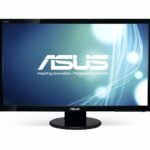 At the moment (March 2017), the ASUS VN279QL is available for around $225. Considering the exceptionally thin-bezel design, big 27-inch size, various unique features, and the vibrant image quality, it’s safe to say that it’s worth the money. You can also purchase it for a slightly lower price if you choose the version with the unadjustable height. 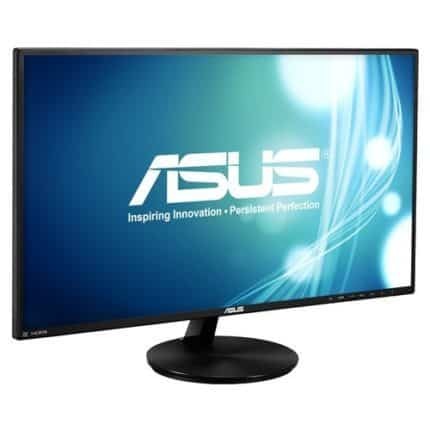 There is also a 23.8-inch version of the monitor, the ASUS VN248Q-P. All monitors come with a three-year warranty. 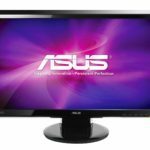 The ASUS VN279QL is an excellent monitor with a beauteous slim design which offers an outstanding performance in video games thanks to its quick response time, low input lag, unique gaming features, and a sharp Full HD resolution. Due to its magnificent design and immersive image quality, it is also a nice choice for a casual everyday monitor for watching movies, web surfing, etc. However, when it comes to the professional photo editing and designing, monitors with an IPS panel provide a more accurate picture; Although some beginner-level and aspiring designers could make use of the monitor as well, once it’s properly calibrated. The ASUS VN279QL offers quick response time, excellent viewing angles, vibrant colors, and superior contrast due to its AMVA+ panel. Moreover, it features an exceptionally narrow frame design, plenty of ergonomic functions, and many unique features.